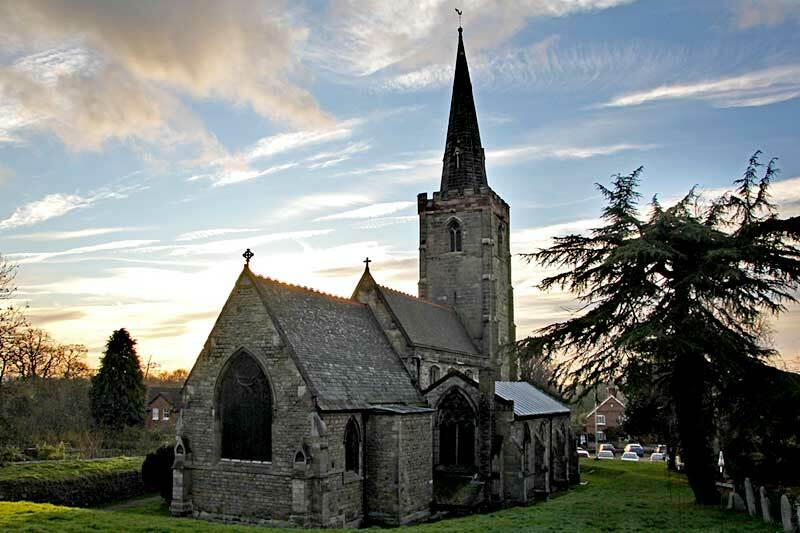 Sutton Bonington has two parish churches, St Michael’s and St Anne’s, dating back to the time when Sutton and Bonington were two separate villages, Bonitone (St Michael’s) and Sudtone (St Anne’s) according to the Domesday Survey of 1086. The survey does not mention a church in either village. The two parishes gradually grew together but remained officially separate until 1829 when local government reforms were introduced. Ecclesiastically they remained separate until the two parishes agreed to unite in 1923 by order of the Privy Council. However, this could not take place until both parishes were in interregnum: this eventually happened in 1950. Both churches continue to be used. 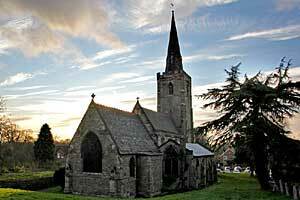 The church consists of a nave of four bays with clerestory, chancel, aisles, south porch and an embattled, Perpendicular west tower with a lofty spire 135 feet high, and a clock and six bells (one named Queen Elizabeth, 1602). The 13th century south arcade has circular piers with moulded capitals, the north arcade octagonal piers with leaf capitals. The arches are identical each side. Round the base of the piers are stone seats, a foot high. Aisle windows are 14th century with ogee reticulation. The clerestory is 15th century. The chancel was re-built entirely in 1878 when a new organ was installed. Nave and aisle roofs were replaced in the 19th century and the pitch of the older roof is visible on the east wall of the nave. A further restoration took place in 1895 led by W S Weatherley, formerly assistant to G G Scott Junior. The oak rood screen and pulpit were added at this time. The church has four stained glass windows by C E Kempe. The 14th century stone font is interesting; it is octagonal, with quatrefoil panels and three projections for book, salt and candle.